Upper Darby police posted surveillance video of Michael Meaney, 25, of Media, who was charged on Feb. 18 with drug possession. The Upper Darby Township Police Department posted a video to its Twitter and Facebook accounts on Tuesday afternoon showing a man allegedly injecting heroin while riding on a bus, then falling out of his chair unconscious until he is revived by a police officer who administered Narcan. 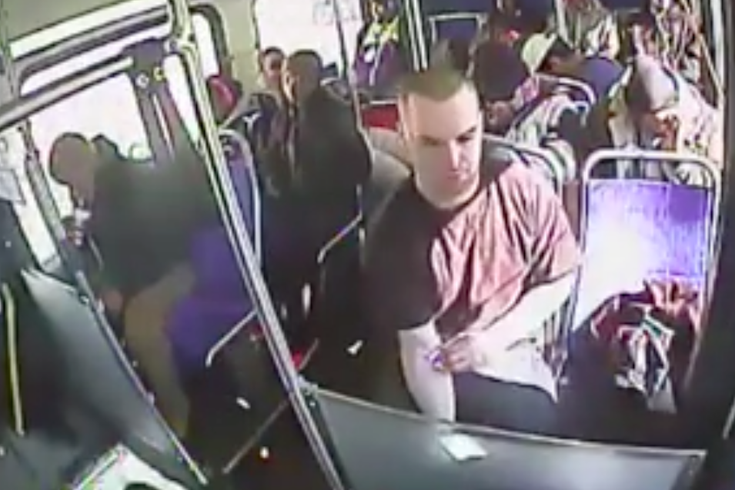 Contacted Tuesday, Upper Darby Police Superintendent Michael Chitwood said that the individual seen in the video – Michael Meaney, 25, of Media – shot up with heroin while riding SEPTA's Route 111 bus at about 1 p.m. on Thursday. In the video, Chitwood said Meaney can be seen injecting his right arm with a syringe, and shortly after, the effects of the drug kick in. "You can see him nodding his head back and then he just falls to the floor," Chitwood said, adding that other passengers on the bus rushed to his aid and called 911. When he arrived on scene, Upper Darby Police Officer Matt Rugh gave Meaney a dose of the anti-opiate drug Narcan to revive him. In Meaney's bag, Chitwood said, officers allegedly found four packets of a white powdery substance that tested positive for heroin. The heroin was in bags marked "Facebook," said the police superintendent. Meaney was taken to Delaware County Memorial Hospital, where he was treated and released, Chitwood said. Also on Tuesday, Meaney was arrested and charged with drug possession and related offenses. Asked why the police shared the video, Chitwood said heroin has grown to be an "epidemic in this country," and he hopes by posting the video to Twitter and Facebook, people will see how a desperate user would inject themselves with the drug in public in broad daylight. "Heroin is a disease; it's an addiction," Chitwood said. "This video shows just how desperate people can get." He also said he hopes to show how well the drug, Narcan, saves lives.